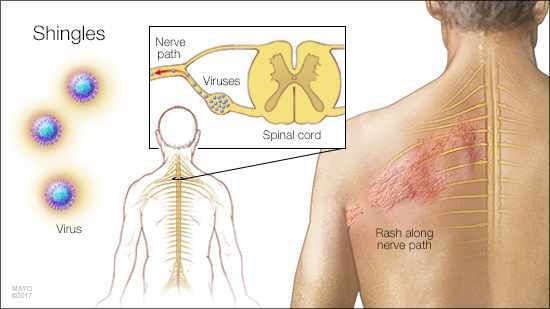 Shingles is a viral infection that triggers a painful, blistery rash. It's caused by the varicella-zoster virus — the same virus that causes chickenpox. After you've had chickenpox, the virus lies inactive in nerve tissue near your spinal cord and brain. Years later, the virus may reactivate as shingles. There's no cure for shingles, but a vaccine can help reduce your risk of developing it.